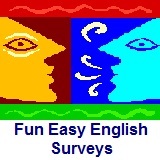 ﻿ Fun Easy English - new classroom free online classes english language lessons speaking listening writing reading january 2. 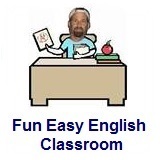 Today in the Fun Easy English classroom you will learn about getting drunk and getting a hangover. Did you drink way too much this New Years? Come on you can tell me. Yes I can keep it a secret. Hmmmm, well okay. Anyway, today you are going to learn some vocabulary about being drunk, a condition brought on by consuming too much alcohol. You are also going to learn about the after effects of drinking too much known as a hangover. Although the majority of Muslims do not drink alcohol, this is still a good lesson for you to study. Yes, many Americans, along with people in other countries, and of different religions, do go kind of crazy during this time of year. 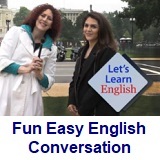 You might find much of the vocabulary from this lesson used in American music, movies, television, writing and in conversations among native English speakers. Hi. In the classroom today you will learn words to describe yourself or someone who drank an excessive amount of alcohol. Many people drink too much alcohol during the holiday season. The most common word for the condition of drinking too much is drunk. Many other words exist in English to describe the condition of being drunk. Which words you should use depends on which country you’re in and even the region within a country. The best idea is to ask someone which words are used in the country you’re visiting. Any of the following words can be used. Try not to drink until you’re drunk. If you do get drunk, remember not to drive. Hi. In the classroom today you will learn about a hangover. The English word hangover is a noun. The unpleasant physical effects following the heavy use of alcohol or a feeling of sickness and headache after drinking too much alcohol. Assume over the holidays you drank too much alcohol and the next day you have a hangover. The following are useful ways to get rid of a hangover. Sleep is the best way to get rid of a hangover. Drink plenty of fluids like fruit juice and water. Avoid drinks with caffeine like coffee, which will make you even more dehydrated and feel worse. Eat food with a lot of minerals such as pickles or canned fish. Eat food with a lot of vitamins such as fruits and vegetables. Many people drink a lot and then sweat to push out the effects of alcohol. The best way to avoid a hangover is to drink alcohol moderately. These are my answers for the surveys below. What is my typical behavior when I get drunk? - I usually become really happy, crazy, talkative, affectionate, and very sociable. What is my worst system when I get a hangover? - Definitely a headache especially after drinking too much wine. Everyone acts differently when they get drunk. and post a comment at the bottom of this page. Everyone feels differently when they get a hangover. Conversation Lesson 2 - Hello, I'm Anna! In this lesson Anna meets Jonathon who lives in the same apartment building. Anna explains that Marsha is her roommate. Pete reminds Anna to call Marsha at work to tell her she arrived. Then Anna goes to see her new apartment. Jonathan: Hey, Pete! Who’s your friend? Pete: She is Anna. She is new to D.C.
Jonathan: Where are you from? Anna: I am from a small town. Jonathan: Well, welcome to D.C.
Jonathan: I am Jonathan. I am in apartment B4. Anna: I am in apartment C2. Marsha is my roommate. Jonathan: I know Marsha. She is nice. Pete: And I am in Apartment D7. I have to go now. Pete: Remember to call Marsha at work. Tell her you’re here. Anna: Right, thanks, Pete. Nice to meet you! Anna: Apartment C2, here I come! Listen to the speaker in the video. Use your computer or phone to record yourself saying the words. Listen to yourself, then listen to the video again. Can you say the words the same way? If not, listen carefully and try again. Watch the video to learn about linked sounds, or how speakers say "you're" for "you are." meet - v. to see and speak to (someone) for the first time. Anna meets Pete near her apartment. call - v. to make a telephone call. I call once a week to talk to my parents. friend - n. a person who you like and enjoy being with. Meet my friend, Anna. number - n. a number or a set of numbers and other symbols that is used to identify a person or thing or a telephone number. I am in apartment number D7. remember - v. to have or keep an image or idea in your mind of (something or someone from the past) or to think of (something or someone from the past) again. Do you remember me? roommate - n. a person who shares a room, apartment, or house with someone else. Anna and Marsha both live in apartment C2 because they are roommates. work - n. the place where you do your job. She is not at work today. We often write our name and address on forms. Americans write and say an address this way: name, number, street city, state, zip code, country. How do people in your country address an envelope? Anna sends a letter to her family. Look at how she writes the address. Do the activity and practice filling in a form and addressing an envelope. Click lesson activity to get the printable PDF version. The page opens to a new window.